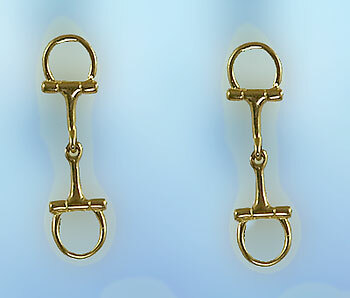 English bit Earrings, the Gorgeous Horse is your source for custom equestrian jewelry. Check out these cool little english bits. You can't beat this simple yet gorgeous design. A little bit of sway, and lightweight, these are great for everyday wear and they're fashionable as well. Check out all of our designs using bits here at the Gorgeoushorse.com. Dimensions:1/4 inch wide x 1 inch tall.